I know it’s been a really long while since I’ve posted anything here, but this is important! 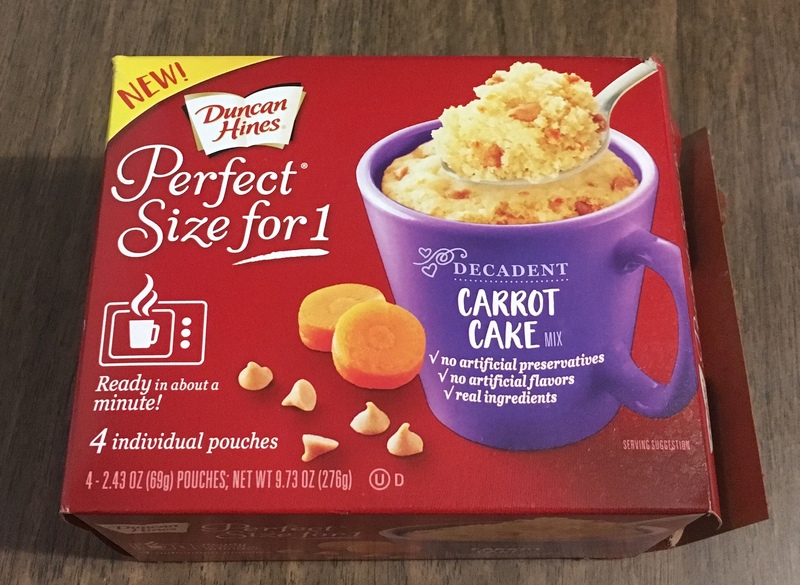 A few weeks back I got a Duncan Hines Perfect Size for 1 box of mug cake mixes. It was a freebie at my local Stop & Shop. Even though we do not have a microwave I figured there had to be instructions somewhere for making it elsewhere.. it’s cake mix, how hard could it be? Right? Whelp, I could not find sufficient data on baking a cake mix designed for the microwave anywhere on the web. So this morning as I opened the cabinet, and spotted this lonely little box of cake mixes, I decided I would just figure it out and share it .. in the event someone else out there without a microwave wanted to make a microwave mug cake. I’m not a master baker but I’ve made plenty of cake in my life, and truly this is not hard at all. 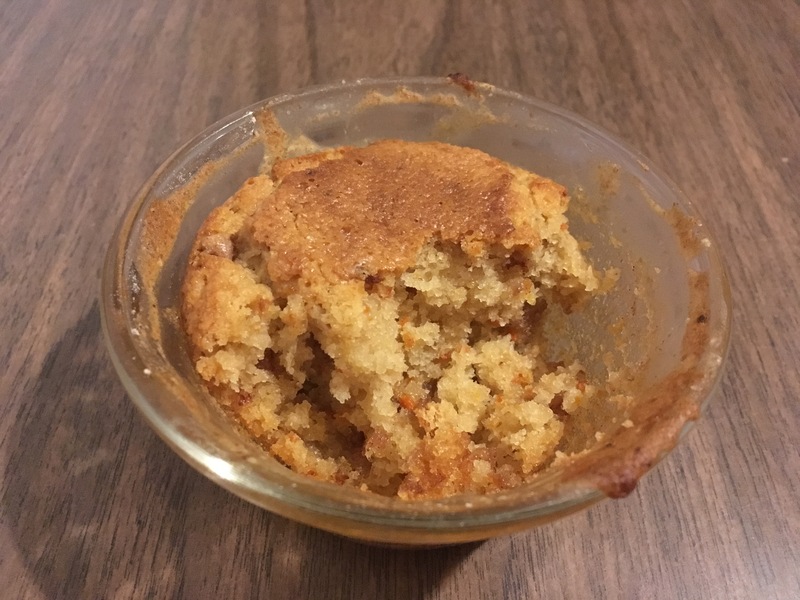 I mixed my cake up with water and a tiny drop of butter (which is not in the instructions, I just know butter makes cake better) in a Pyrex custard dish and used my toaster oven, set to 350 degrees for 25 minutes. Now, I use my toaster oven for anything that will fit in it. Anything. If the pan or dish I’m using fits in the toaster, that’s where it goes .. winter or summer, lasagna or leftovers. My point is, I’m very aware of how my toaster oven heats things and that’s important for anything you are baking. If you have an unpredictable baking device, check your tiny cake every 5 minutes. Regardless of what you want to bake this thing in, you really only can mess it up once and then you will forever know how to tweak it to work perfect for you. So, 350 degrees for 25 minutes made a perfect little muffin sized cake for me. I did this in the morning before school and it sat in the toaster finished for about 5 minutes as I walked one of my kids to the bus stop. Once I got to it though, it was baked all the way through and moist. I probably should have snapped a picture prior to taking a bite, but it seriously smelled delicious. It was supposed to be carrot cake, but tasted more like coffee cake to me. It was a good little coffee carrot cake though, and I would even get it again if it were free or I had a coupon and it was on sale. It was kind of nice to have a little warm cake that was just for me and no leftovers for the kids.. muahahaha! Hopefully this helped someone out there looking for ways to bake microwave mug cakes! Thanks from me too!! Someone visiting from the U.S. left these for us as a treat…we are living overseas…..but we don’t have a microwave! I was wondering what to do…..great little post to find!! You are welcome, I hope they are tasty! This is exactly what I was looking forward to. I was just wondering if you put foil over its or do you just put it in the oven as so? I did not put foil over it, as I typically wouldn’t cover any cake I was baking. If you do and get good, or better, results I’d love to hear about it.